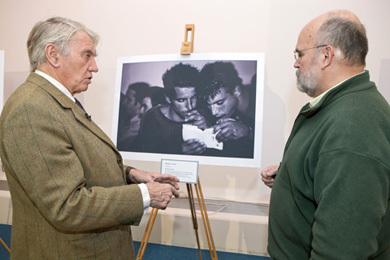 A u2018powerful sceneu2019 of former drug addicts reading the New Testament has triumphed in a photography contest judged by renowned photojournalist Don McCullin. Judges praised ‘Brothers in Arms’, by Paul Triller, for its ‘immediate impact, fantastic use of light and real intensity’. Paul, who shot the winning image in Romania, won a £1,400 prize that included a Nikon 1 V1 camera. The photo (above) won the Moments of Faith category. Open to amateur photographers across the UK, images were judged on visual impact, composition and emotional connection. Paul was also presented with a camera-shaped trophy. Judges included Secretary of State for Communities and Local Government Eric Pickles. The competition was organised by Congregational & General Insurance.